Renaming of our little dinghy. Notice the flying cork. We love people, but we also enjoy solitude. We are landlubbers, but the sea always attracted us. We moved to a seashore on the northern coast of Taiwan. We wanted to know, whether our passion for the sea is going to loose strength. However, The sea beguiled us forever. Then it was but a small step from a small plywood dighy to our cruising sailboat Janna. This how it all started and then there was a cruise from Singapore to Langkawi and then from Langkawi to Hong Kong, around Borneo and via Philippines. We are currently living in Kaohsiung, Taiwan. Jana has finished a PhD at the Chinese department of the Cheng-chi University in Taipei, thesis “從「現實」到「寫實」── 八○年代兩岸女性寫實小說之比較”. More than literary criticism she likes to splice rope and cook and translate. Petr has finished a PhD in formal semantics at the department of CBS at the Hong Kong Polytechnic University. Thesis title Procedural Lexical Semantics. 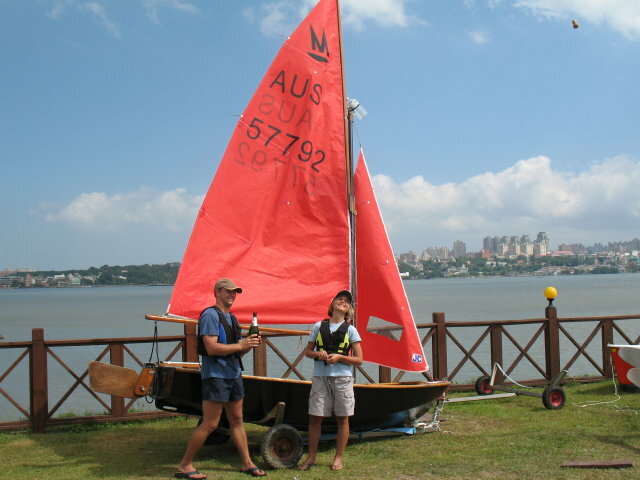 More than programming he enjoys fixing boat gear, reefing and writing. From the work of Taiwanese poet Yu Hsiho 愚溪 we have translated long epic poem Neposkvrněnost (Point of Pristine, 碧寂) , fairytale Moudrý lovec (Wise huntsman) and children’s story Život lístečku (The Diary of Pristine Leaf). All into the Czech language. All published in Taiwan and given to Dagmar and Václav Havel and his foundation for children VIZE 97. Ďábelská žena (Devilish Woman), Brody 2010, 460 pages. Collection of short stories of Taiwanese female writers. Editor and principal translator Jana Benešová. 4 stories by mainland Chinese writers for a new anthology of Chinese literature being prepared at the Palacky University. Currently translating two novels by Li Ang 李昂: 迷園 and 殺夫. Currently preparing a project for a translation of 白先勇:台北人 and 黃春明:兒子的大玩偶. We like to write, share, we like to tell stories. There might be a little bit of a need to show off, sure. But when we were starting, we were hungry for information and we were grateful wherever we stumbled upon a piece of honest confession how others were starting, where they messed up and what they would have done better. We promised ourselves to pay it back to those people, but since they have already made their first steps, we ended up with paying it forward. Not everything is in English! Sorry about that. We are trying to keep up. If you are particularly interested in some page or a post, let us know and we try to translate is as soon as possible. It’s just one of many great ways how to enjoy life 😉 Happy New Year to you. It was a pleasure meeting you!